Lilly King won twice as the IU women rolled past Purdue. 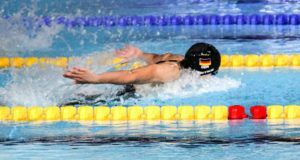 The fastest breaststroker in history took both breaststroke events, but not by much. In the 100, she was 1:01.12 to edge teammate Noelle Peplowski (1:01.81). In the 200, things were closer, with King winning at 2:14.03 to teammate Laura Morley‘s 2:14.50. King was actually over a second behind Morley at the 100 mark and reeled her in over the back half. The last time King was over a minute in a swim meet was this meet last year, when she went 1:01.36. She hasn’t been slower than 2:14 since October of 2016, meanwhile, in the 200. Most likely, IU is going through a tough training block before coming down for Big Tens, as the team as a whole seemed a bit off. Off or not, IU won the majority of events, including Jessica Paratto sweeping diving. One of the most impressive swims of the day came from IU’s Bailey Andison, who clocked a 4:18.22 to win the 400 IM. Andison, who placed 5th in this event at the 2017 NCAA Championships, has been 4:05.44 this year. Purdue got a couple wins, with Maizie Seidl going 1:49.65 in the 200 free, Jackie Smailis going 54.46 in a Purdue 1-2 in the 100 back, and Taite Kitchel taking the 200 fly (2:00.55). Zachary Apple led the way for the IU men, clocking three individual wins. Apple, a huge part of the IU lineup after transferring from Auburn, took the 50 free, 100 free, and 200 free. 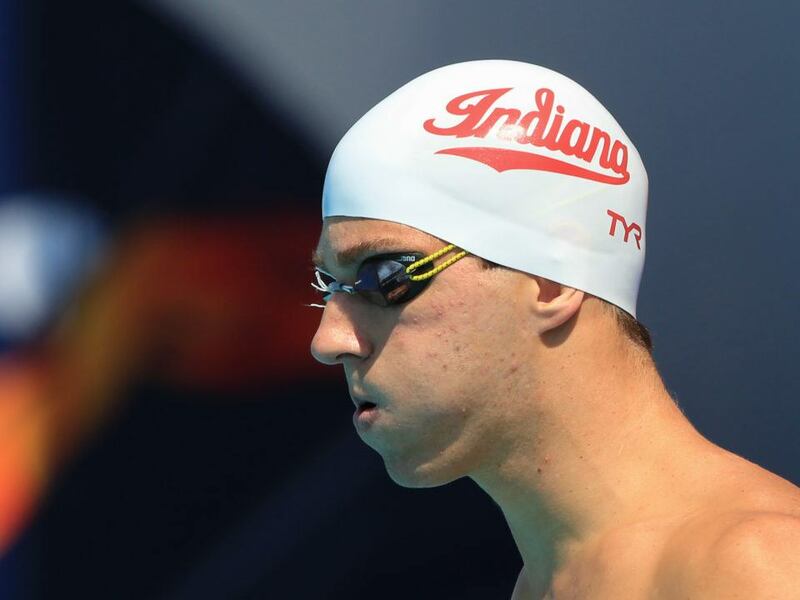 He was 20.09 to edge teammate Mohamed Samy (20.12), then 44.27 in the 100 free and 1:38.77 in the 200 free. Apple wasn’t on their 200 medley relay, which won at 1:27.46, getting a 21.79 leadoff from Gabriel Fantoni and a 19.64 anchor from freshman Brandon Hamblin. Hamblin broke 20 seconds for the first time ever at the Indiana Invite, and he’s looking to be a sprint piece for the Hoosiers. Fantoni would go on to win two of his three individual events. In the 100 back, he raced to a 46.64, winning by almost two full seconds. He was 45.95 at NCAAs last year to place 17th, just missing scoring, but going 46’s in-season is impressive and bodes well for him. In the 100 fly, he posted a 47.67 to edge teammate Vini Lanza (47.90). Fantoni couldn’t quite triple up, getting touched out in the 200 back, 1:45.85 to 1:46.33, by Samy. Freshman Michael Brinegar won twice, first going 9:07.43 in the 1000 and then taking the 500 (4:26.25). 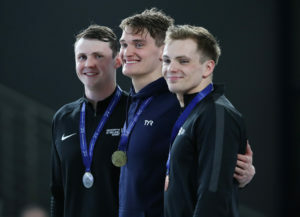 For whatever reason, Brinegar subjected himself to exhibitioning the 200 free right after the 1000, and also exhibitioning the 400 IM after the 500, going 1:44.49 and 4:01.78, respectively. He totaled 2,100 yards of racing. IU won the 400 free relay to close the meet at 2:57.23, getting a 43.93 lead-off from Samy. Diving was an exceptional clash between two of the best diving programs in the country. Indiana’s Andrew Capobianco won the 1-meter, amassing 424.95 points, 34 points behind Purdue alum David Boudia’s 2011 pool record. Purdue’s Joey Cifelli won an exhibition 3-meter (390.90), while Boilermaker Brandon Loschiavo scored 410.40 to win the platform. Loschiavo was Purdue’s sole win on the men’s side. It would be awful hard for the Indiana men to give up an event in the women’s meet. Otherwise, great headline…. That lineup and performance form Brinegar is worthy of its own article. Or at least part of the headline. That’s a painful day.